Learn to FLY Playshop: Playing with Pincha! Booking essential as it will be a small practice group! 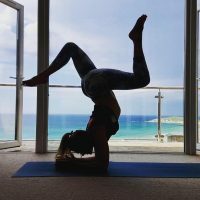 A 2.5hr masterclass with Jen to learn how to incorporate inversions and arm balances into vinyasa flow! Our Playing with PINCHA special ‘Learn to FLY!’ workshop-style class will explore how to find Forearm stand (Pincha Mayurasana) from a strong base and we’ll share our tips and techniques for balancing on your arms with ease & grace. We’ll look at the foundations needed to put into place to be able to add seemly tricky inversions into your flow practice safely. We’ll be using a mix of props and partnering as well as free flow to explore different ways of getting upside down. Expect creative vinyasa sequencing with pauses to practice balancing on our head, arms and hands before mixing them back in through safe and fun transitions!